Can upstart Colorado steal the spotlight from mighty Nashville? 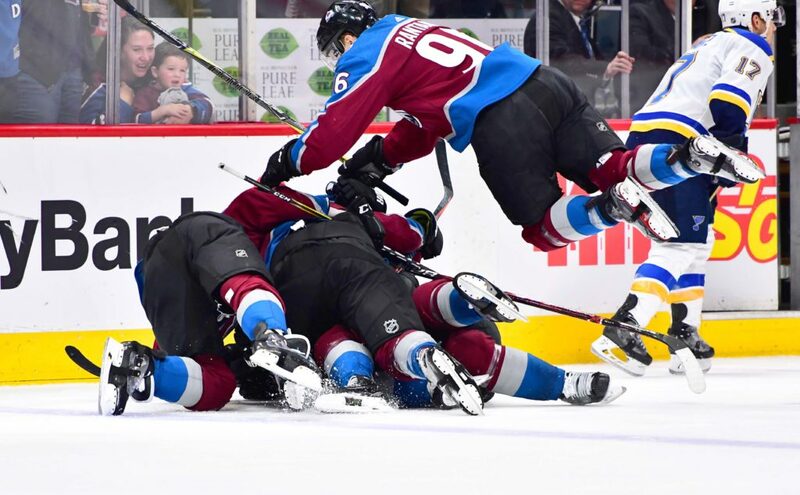 The Colorado Avalanche return to the NHL playoffs for the first time since the 2013-14 season, where they lost to the Minnesota Wild in the first round. The Avalanche are set to square off against the President’s Trophy-winning Nashville Predators this Thursday in what should be a extremely entertaining series filled with high-profile players. While Nashville looks to redeem themselves from last year’s heartbreaking loss in the Stanley Cup Finals, the Avalanche look to step into the Predators’ shoes from a year ago and reenact the success they had as the eighth seed in playoffs. Although the regular-season series wasn’t too kind to the Avalanche, it’s hard for any team, even mighty Nashville, to sweep a season series with a team — and then have to beat them four more times in the postseason. Nathan MacKinnon is a Hart Trophy candidate this season after setting career-highs in goals (39), assists (58) and points (97). He has lead the Avalanche to the playoffs only one season after one of the worst seasons an NHL team has had in years. MacKinnon will need to continue to produce at the level he has all season to help lift the Avalanche into the second round of playoffs. P.K. Subban has been one of the best defensemen in the league for years now, and this season, he should be considered for the Norris Trophy as the NHL’s best defenseman. With 59 points this season, Subban ranked third on the Predators, and while he is one of the best scoring defensemen in the league, he is also one of the best shutdown defensemen on a team with incredible defensive depth. Since Matt Duchene was traded away, the Colorado Avalanche have assembled one of the deadliest first lines in the league. MacKinnon, Mikko Rantanen and Gabriel Landeskog, combined for 243 points and a plus-20 goal differential as a line this season, good for third-best in the league. The Predators’ top line consists of Filip Forsberg, Viktor Arvidsson and Ryan Johansen, who have combined for a total of 179 points this season. The Predators have relied more on depth scoring and outstanding play from their deep core of defensemen in front of Vezina Trophy contender Pekka Rinne. Nevertheless, the top-line matchup should be a good one, and will be crucial in deciding which team moves on. For the Avalanche, it comes down to the third line. The top line will continue to score and wreak havoc on other teams, but when facing a Nashville squad with so much depth at the back end, it will be crucial for Matt Nieto, Blake Comeau and Carl Soderberg to play at their best. The trio has seemed to find the back of the net at crucial moments throughout the season and help energize the team. Nieto and Comeau are both playing some of the best hockey they have in their careers and Soderberg has drastically improved from his 14-point season last year. The line has combined for 97 points this season and played effective defense all year long; they’ll have to be at their very best if they’re to find a way to slow the Predators down in between the blue lines. The Predators’ depth is simply unmatched. While their gritty and skilled third and fourth lines will cause problems against any team, the second line of Kyle Turris, Craig Smith and Kevin Fiala all have had great seasons, combining for 141 points — which isn’t all that different than their top line. Similar to the Avalanche’s third line, the Predators on the second line are having some of the best seasons of their careers — especially Fiala, who collected 23 goals, 25 assists and 48 points in his first full NHL season. Jonathan Bernier has spent most his 10-year career serving as one of the league’s most reliable back up goaltenders. With Semyon Varlamov out with a lower body injury, Bernier will lead the way for the Avalanche. This season, Bernier posted 19 wins in 34 starts with a .913 save percentage and 2.85 goals against average — right around league average. Unlike a majority of the young Avalanche teams, Bernier is no stranger to the NHL playoffs, having played on the Los Angeles Kings team that won the Stanley Cup during the 2011-12 season and for the Anaheim Ducks, who lost to the Predators in the Western Conference Finals last season. Since his first full season in 2008, Pekka Rinne has been one of the most well-respected goalies in the league. With over 300 career wins and with multiple Hart and Vezina Trophy bids under his belt, Rinne will be a tough task for the Avalanche. This season, Rinne again built a strong campaign for the Vezina Trophy with 42 wins in 59 games, a .927 save percentage, 2.31 goals against average and eight shutouts. Rinne is among the league leaders in just about every statistical category as presents a monumental challenge for the Avs. It’s time for 19-year-old rookie Samuel Girard to shine. The slick-skating Girard has 23 points (four goals, 19 assists) and was traded from Nashville to Colorado as a part of the three-team Duchene deal. With Erik Johnson lost to injury, the Avalanche don’t have the same physicality or experience, so players like Girard might have to compensate by trying to put points on the board. The Avalanche will need high-scoring blueliner Tyson Barrie and big-hitter Nikita Zadorov to continue their production, but if Girard can play with the intensity and skill he did in the regular season finale against St. Louis, it would be a great boost to the weakest part of the Avalanche roster. For the Predators, it’s hard to choose just one key defenseman from their stacked blue line, but Ryan Ellis constantly seems to be lost in the shadows of All-Star caliber defensemen P.K. Subban and Roman Josi. Ellis missed the first half of the season due to knee surgery, but returned for the final 44 games. Ever since his return, he has been on an absolute tear, racking up 32 points in his 44 contests. While Subban and Josi will rightly attract much of the attention, if Ellis can keep up his hot play, he will be another player added to the long list of Predators players that the Avalanche need to worry about. As expected, over the last ten seasons the eighth seed in the Western Conference has not fared well in the first round of playoffs, winning only twice (including Nashville last season). That said, the Avalanche will be forced to go into one of the most hostile arenas in the league, now known as “Smashville,” to try and conquer the team with the best record in the NHL. The Avalanche have a 15-19-7 record in away games this season; that obviously won’t cut it in this series. The Avalanche have essentially been playing playoff hockey for the past two months while fighting for the last spot in the playoffs. It’s fair to wonder if they’ll have enough left in the tank to upset the Stanley Cup favorites. The Avalanche have the firepower to do it, but they’ll have to play the best hockey they have played all year long. The NHL’s youngest team will certainly be amped for their first-round matchup — one between the NHL’s best team, and the NHL’s most unlikely playoff participant.